We've got two new videos this week as well as some exciting new products. It's once again Friday, and you know what that means! It's time for new products. We've got a few big products this week. 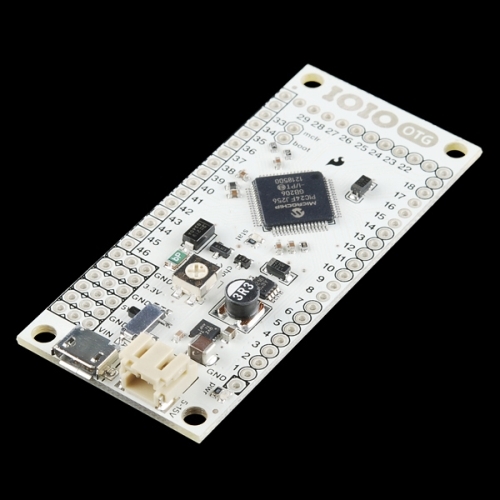 Many people have been eagerly awaiting the release of the new version of the IOIO (as well as the Netduino). We even decided to take a little extra time and do a stand-alone instruction video on the Shift-In Breakout. Shift registers are pretty useful if you need more inputs or outputs. 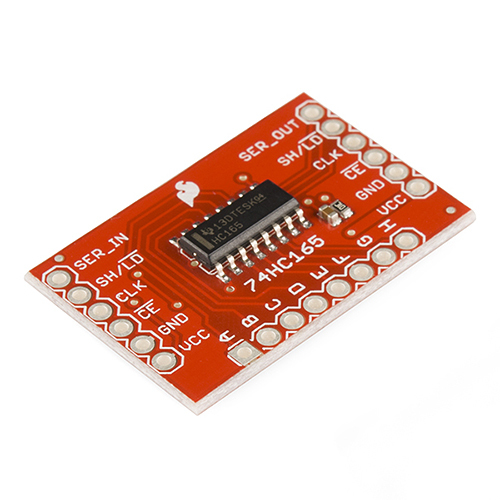 Connect up a few pins from your microcontroller, and you can have access to as many (almost) inputs or outputs as you want! We have two breakouts that make it easy. So now you don't have to be limited by the number of digital IOs on your microcontroller! Hopefully that helped simply explain how they work. The new version of the IOIO is finally here! With the IOIO-OTG, it's now possible to use the board as an 'on-the-go' device, as well as a USB host. It even comes with an OTG USB cable. If you're a Java developer looking to add advanced hardware I/O capabilities to your Android or PC application, this is the board for you! 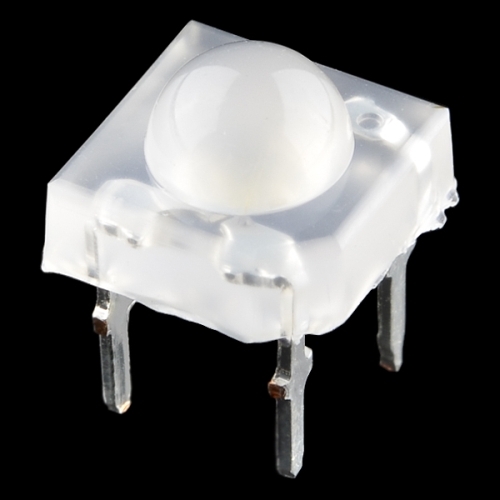 We now have a new supplier and stock for our Piranha 5mm LEDs. These square common cathode RGB LEDs have 4 legs and can fit into a breadboard for testing. These new versions are much brighter than our old ones, and we now sell them as singles. The SN74HC165N is a neat little IC that will take an input of up to 8 parallel lines and produce a single, serial output. We now have a breakout that uses this IC and allows you to increase the number of digital inputs on your microcontroller. Each board can be daisy-chained for epic digital-inputness. We have a new version of the popular Netduino development board this week. 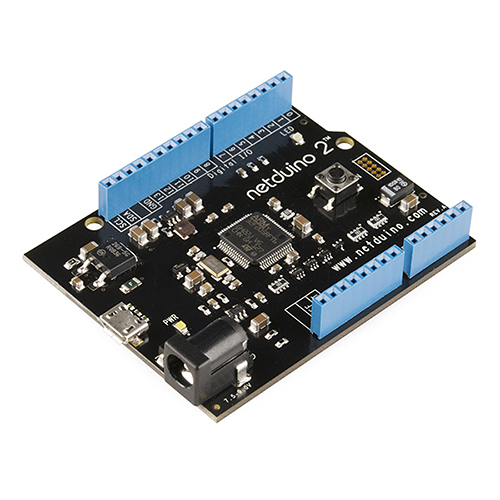 The Netduino 2 runs faster, has more code space, and even sports 2 additional GPIOs. It even works with Arduino R3 shields! If you need a bit more horsepower, check out the Netduino 2. And lastly, we have a revision on a 4D Systems OLED. The μOLED-128-G1 is now the μOLED-128-G2 and gets some hardware and software updates. 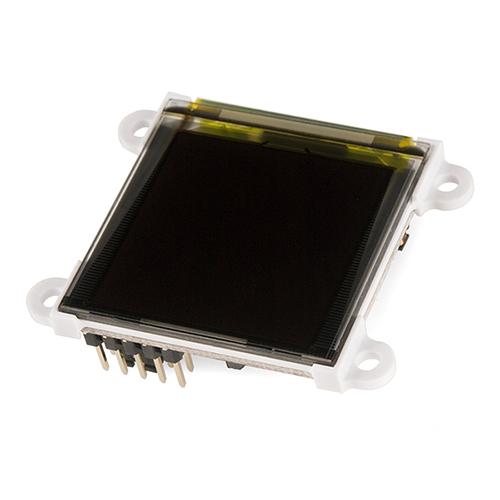 The 1.5" OLED module can act as a standalone module or work with another microcontroller for powerful embedded applications. Thanks guys for keeping our hobby alive with new stuff every week and for letting everyone know whats out there with these updates. When I need to get anything for my Arduinos or robot,I come here first. You guys are top shelf. How fast can one pump out data to a shift register before it would become noticeable? For example, a LED cube. If you wired together a few registers how many pins or LEDs could you control before you could see the animation time of said cube diminishing? If you take into account we are not using any charlieplexing. EDIT: Forgot to add, with an Arduino. Shift registers are quite fast. The 595, for instance, has a guaranteed shift frequency of 30MHz. You may find that an Arduino running at 16 or 20MHz will be the limiting factor in a large cube. One way to speed things up might be to write your own shiftOut function instead of using Arduino's standard shiftOut. By using low-level commands to write directly to the Arduino registers for the clock and data pins, you may be able slim down and save precious clock cycles. Or even assembly, especially if you need to count clock cycles to coordinate things. Netduino description shouldn't it be even supports 2 additional GPIO's? No, because it has 2 more built in/broken out. Like if I put on a speedo and went to the beach. People would be like "Wow, look at that guy sporting that sweet speedo." This has to be one of the best replies a company employee has ever posted to any question. EVER. Nick, is it possible to eliminate the uc with a clock and some divide by 8 counters? The nice thing about shift registers is that they use synchronous serial, thus the clock line, and they're not really picky about the speed or consistency of the clock. You could hook up a couple of pushbuttons and clock in bits by hand if you wanted to! There's no reason you couldn't get rid of the uC in my example. Robert points to a 74HC165 and says "input", Nick points to a 74HC165 and says "output"... I'm so confuzzled! Both the 165 and 595 take some input and provide some output. The 165 is a parallel in, serial out chip. It's reads 8 input lines and serially shifts them out. The 595 is a serial in, parallel out chips. It shifts in 8 'states' and sets 8 output lines accordingly. From the perspective of creating more IO lines, the 165 is useful for creating more input lines, thus it's an 'input' device. The 595 is useful for creating more output lines, thus it's an 'output' device. Also Robert, it's ALWAYS good news!!! Great presentation! It's not always easy to find accessible explanations for these kinds of devices. They do! Mastery of dark magic has been a requirement for Sparkfun employees for years. Wow shift registers really are going to be helpful for me in the future.......So instead of buying an Arduino Mega 2560, I could buy an uno and a shift register(or multiple) and control just as many inputs/outputs? what about a 64x64x64 LED cube? why not larger than that?!? There's an extra '0' at the end of the link.